A Liverpool supporter who survived the 1989 crush at Hillsborough has described "having to concentrate on staying alive" on the terrace. Colin Moneypenny said he found himself in a central pen but managed to make his way back out after pressure eased. 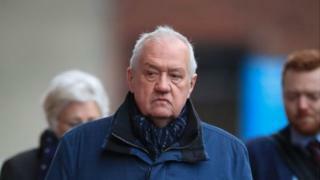 Statements from some of the survivors of the disaster at the FA Cup semi-final, in which 96 people died, were read to the jury at the trial of Mr Duckenfield and former Sheffield Wednesday club secretary Graham Mackrell. Mr Moneypenny said when he was in the central pen he was "presented with a situation where I had no longer come to see a football match, I was having to concentrate on staying alive". He said: "On leaving the ground on to Leppings Lane I saw a group of policemen laughing and joking between themselves." He added he told one officer: "There are people dying in there," but the officer "was obviously totally oblivious to problems inside the ground". Christine Agnew QC, prosecuting, also read a statement from off-duty Merseyside Police officer Colin Allen who attended the ground as a fan and went into a central pen. He described the crush as "vice-like" and said: "At one stage it was almost impossible to even raise your arm." Mr Allen said he blacked out at one stage in the crush but was eventually able to get into a side pen and on to the pitch, where he helped treat fans. He said police performance on the day was "pretty non-existent from start to finish". The court heard a statement from former police inspector David Bullas, who was on duty in the West Stand above the terrace. He described seeing a "river of people" entering the central pens in a scene that reminded him of when "molten lava is shown running down a hillside from an active volcano". Retired police inspector Peter Darling, who was in charge of officers based on the perimeter track, told the court he helped to bring people out of the pens after realising there was a crush. Asked if any instructions were given to him, he said: "At that time no, the officers were still having problems with communications on the radio and really officers round there were just doing what we thought the best to do in that difficult situation." Sheffield Wednesday's ex-club secretary Graham Mackrell, 69, denies a charge related to the stadium safety certificate and a health and safety charge.